Now that you know what pitch to tune all the strings to, all you need is a reference point. If you have a piano or keyboard, you can use that. Also, if you are on a shoestring budget, and you are just getting your feet wet in musical instruments, I’ve found an excellent tuning program. Pictured above is a handy little gadget that I don’t think I’d be able to live without. This small little handheld digital tuner has a built-in microphone that hears the note you’re playing, and shows you whether it is sharp, flat, or in tune. In the above picture, you can see that the note is G, and that it is perfectly in tune because the green light in the middle is lit up. Had the note been out of tune, the flat (b) or sharp (#) light would be lit up and the swing-arm needle would be pointing to the left or right. In my experience, it has given very accurate results. The two best places to pick up one of these tuners is on eBay, or Amazon.com. It seems that everybody and their brother is selling these online. Otherwise, if you need it quickly, chances are some music shops will stock them in your local area for a bit more. I picked mine up locally from Groth music. There are all sorts of tuners, but you have to make sure that you get one that is chromatic. That is to say, one that will pick up and tune any notes, including flats and sharps. Some will only do certain strings, such as a tuner meant specifically for a guitar. One that was highly recommended to me for both reliability and economy was the Korg CA-30. You should be able to find one for around $20. This is the tuner that I use, and I’ve been completely satisfied with its performance. Another recent development in tuners comes with the popularization of so-called “smart phones,” which can do a variety of tasks. 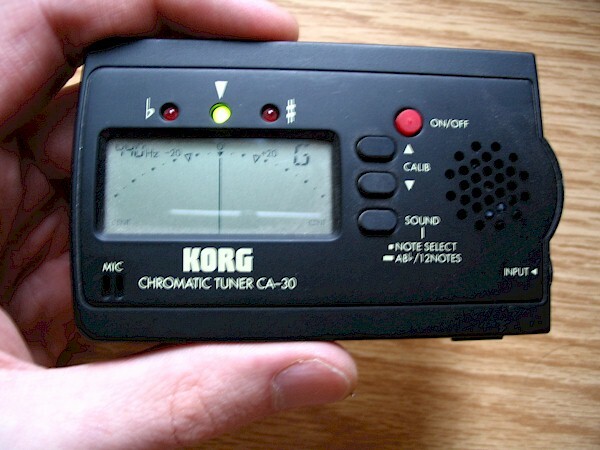 Since phones already have a microphone for talking into, and a display screen, they are well suited to be used as a digital tuner. Different phones have different operating systems, (and consequently different applications available), but chances are, there is a digital tuning program available for your phone. Just be sure to try it out before you buy it (via a demo), or double check that it’s the type that “listens” to the string being played through the mic on the phone, rather than the ones that simply play certain notes for you to synchronize by ear. If you are tuning your instrument for the very first time after stringing it, your procedure will be a little bit different than an everyday tuning. For one, now that you have strung the psaltery, it begins a break-in process. During this time, the strings settle into their spots and the instrument as a whole adjusts to the added tension. In subtle movements, the frame of the psaltery will flex and react to the hundreds of pounds of pressure that are now pulling on it. Overall, your psaltery’s strings will tend to go flat – that is to say, the tension will be reduced and the pitch will be lower. Within a week or two most fluctuations should subside. But in order to speed this process along, certain adjustments can be made to help the psaltery “settle in” faster. As I briefly explained at the end of the stringing section, the better a job you do when tightening the knots at the hitch pin, the shorter the break-in period will be. This is because when you bring a string up to tune and subsequently play it with the bow, the vibrations of the string will shake the slack out of the line, causing the string’s tension to drop. As a matter of fact, when you first tune it, chances are that by the time you get to the last string, the first string will probably already be out of tune! Don’t be discouraged by this immediate loss of tension—it is a normal process with every new bowed psaltery. This is why the first time tuning will be different than your everyday tuning. Do you think that we should try and get the string to an absolutely perfect pitch knowing that it will probably be out of tune by the time we get to the last string? No, don’t worry about it! For our first tuning, it will be sloppy. Don’t worry about getting things dead-on. You won’t really be playing it after the first tuning anyway. You are just looking to bring it up to the correct note, but it doesn’t have to be perfect. First tune it sloppily applying the techniques for first tuning that I’ll describe below, and then afterward retune it according to the everyday tuning section. (See the everyday tuning section on the basic mechanics of tuning.) The psaltery will get more and more stable with each tuning. Once you have brought the string up a little sharp, “balance” the string by taking your finger and pressing down on the string (somewhat) firmly to help settle it in. Chances are that the pitch will immediately go down below where it should be – even if you had tuned it sharp. Retune the note sharp again – perhaps a little less this time – and repeat this process a few more times until it seems as if the string is starting to stabilize. But just don’t press too hard…. Try pressing down on the string in different areas to settle in different areas – in the middle, near the hitch pin, and near the bridge. Even if it seems as if the string has become perfectly stable, tune it ever so slightly sharp, never slightly flat. In this beginning phase, the strings almost always loosen and go flat, and not sharp. Chances are, the frame, soundboard, and bridge will all flex and react to the new tension, though usually imperceptibly to our eyes. Here’s a video showing how I proceed with this process. Actually, I balanced it a few times, but then brought the string down to its regular pitch for good measure. On our demonstration psaltery, it had pretty stable tuning very quickly. After the 2nd tuning, nearly all the strings were still in tune after playing some songs! By the next day, only two or three strings were flat, but not by much. Now that you have seen how to help accelerate the stabilization phase, it’s time to learn just how to tune the psaltery for playing. Unlike the first time we tune the psaltery, everyday tuning will be times when we want to get the strings exactly in tune for playing. In most cases, they should already be very close to in tune, so very few coarse adjustments should have to be made. To raise the pitch of a given string, turn the wrench clockwise; to lower the pitch, turn the wrench counter-clockwise. Turn the wrench slowly and in a controlled manner. 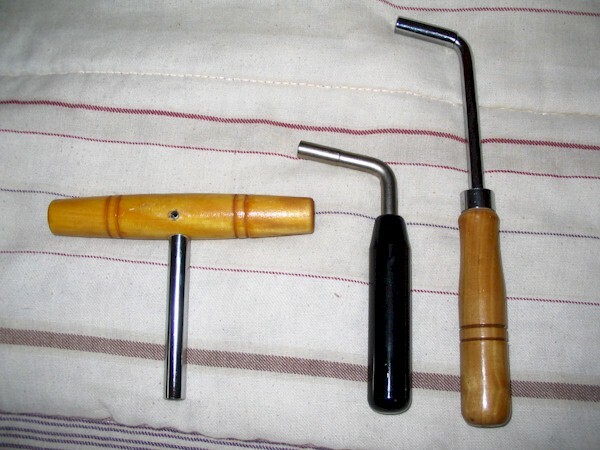 Its strongly recommended to either pluck or bow the string while you are tightening it. Not only is this necessary to hear if the string is coming into tune, but more importantly, it will prevent you from accidentally tightening the wrong string. When you turn the wrench, you should be able to audibly hear the pitch change up or down on the string, depending on which way you are turning the wrench. If you do not hear any change in pitch when you turn the wrench, stop immediately. Trace the string you are trying to tune: start from the hitch pin and go back down to the corresponding tuning pin and make sure that that pin matches the one that you are turning with the wrench. If you continue to tighten the wrong pin, the string could break. If you do happen to break a string during tuning, you may want to know the procedure for replacing a string. The order that the strings are tuned in makes no difference; whatever is fastest and most convenient for you. 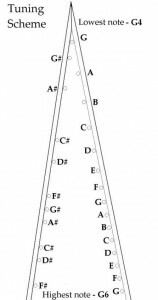 For your first time, I would suggest starting with the lowest note at the tip and proceeding down to the base of the psaltery on the right-hand side, and then work from the tip to the base on the left side. The lowest notes are the easiest to tune. On the tuning chart, I have written the notes on the left-hand side all in sharps (#) for clarity. 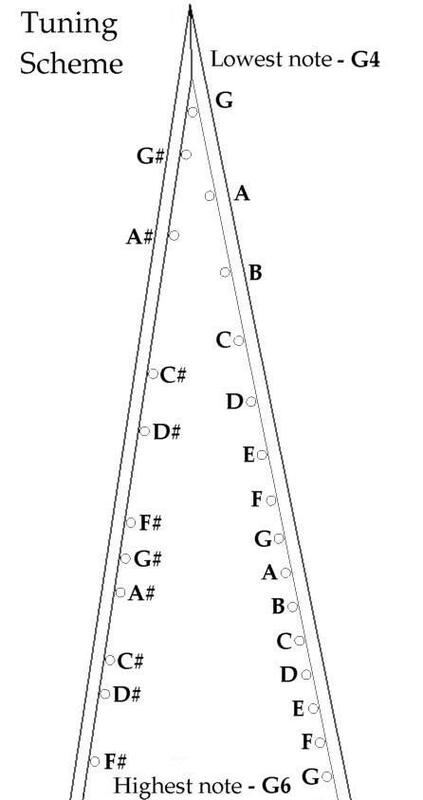 A-sharp is the same note as B-flat, and D-sharp is the same as E-flat, and so on. It is akin to seeing the glass half empty or half full. Whenever possible, try to tune a string up to a given pitch, rather than go too far and have to bring the pitch downward. (This of course excludes the first time you tune a newly built psaltery.) If you tune a string down to the right pitch, the section of the string running from the bridge to the tuning pin may be slightly looser than the section of string running from the bridge to the hitch pin. Lightly balancing the string (as discussed in the previous section) may help remedy this. 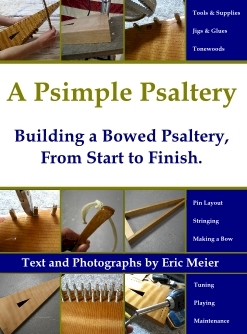 Tuning is usually quick and easy and should become a regular part of caring for your bowed psaltery. With a little practice, it shouldnt take more than a few minutes. Also, depending on how often you play, you may not have to retune your instrument very often; or it may just need a very tiny tweaking. When I named this section “everyday tuning,” I didn’t necessarily mean that you’d have tune it every day.